This cereal was described as "a crunchy, sweetened cereal made from oats, crushed nuts and natural cinnamon." 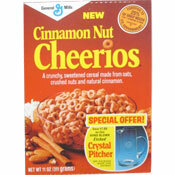 What do you think of Cinnamon Nut Cheerios? Was this an early version of Honey Nut Cheerios? I want to know if General Mills will ever bring back this cereal because I wasn't even born when it came out so they should bring it back so that anyone who didn't try it can. 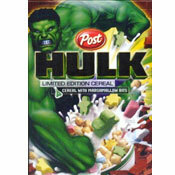 There is still only one example of this cereal box known to exist! !